With this app you can access all your web and app data from their handheld devices. You can monitor recent changes with Real Time reports including visits, sources, page views and user behavior insights. The real time analytics is the outstanding and most useful feature of this app which will provide the website’s current activity to the users. You can also use the app to view user behaviors, conversions and more. Two years before Google released the Google Analytics app for Android. For now, Google Analytics for iPhone is not optimized for the iPad, however the iPad support will be added in a future update. The app is compatible with the iPhone, iPad, and iPod Touch. It requires that the device run on iOS 6.0 or later. “Access all of your Google Analytics web and app data from your mobile device. Monitor recent changes with Real Time reports. Easily get your Analytics data anytime, anywhere. 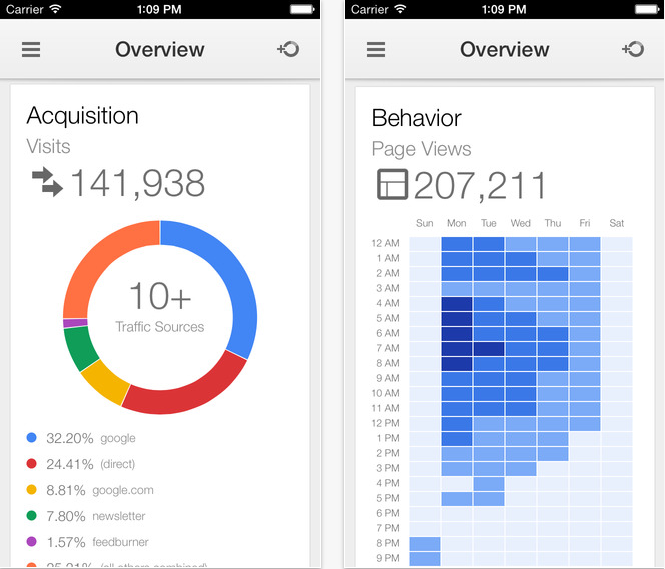 You can download Google Analytics to your iOS device right here.